Although the occasion calls for fine china, the mood is light and informal. Playful icons of the season-bunnies, eggs and candy are among the place settings. A grass centerpiece captures the thrill of the egg hunt in miniature. The spring table is a cheerful mix of contrasts and embellishments. "The value of a Dollar"
and thrift is my game. Lots of eggs to hunt. If it rains we can hunt for Easter eggs in the house. LOL!!! This tablescape is a very Thrifty Tablescape. I bought the pink flowered salad plates at our church yard sale last year. 'Pink Perfection' camellia tree is still blooming, but the rain has discolored so many blooms I found just enough flowers to make the two bouquets for the table. The clear plates are from a yard sale a few years ago. (.10 cents each x 12) what a deal. White paper dollies from Michael's craft store and another DT clear plate underneath. Cute clear tea cup and saucer called 'Fairmont' exclusively designed for Bella and produced by SOGA Japan. I bought a box of six at TM for $2.49 and I have some fun ideas for these cups this summer under my new pergola. This morning my sweetheart and went outside and to the end of our property and dug up the grass in the Easter basket. I didn't want to ruin my garden box, so I lined it with clear plastic wrap and one square shovel of grass fit into the box perfectly. Candy is always welcome at Easter. Candy Eggs for the girls (granddaughters) this Sunday. 'Pink Debutante' camellia is very slow to bloom and the rain has discolored most of the blooms. But I found a few to add to the bouquets. A brand new Goodwill Store opened last week and I found these vintage glasses for .49 cents each. Wishing you a Glorious Easter. and I have a dessert to share with you in my next post. Love the centerpiece and the napkin rings! Beautiful table. What a fun table...the centerpiece is fabulous! All your bunnies are so cute they make a nice arrangement with the grass filled basket. 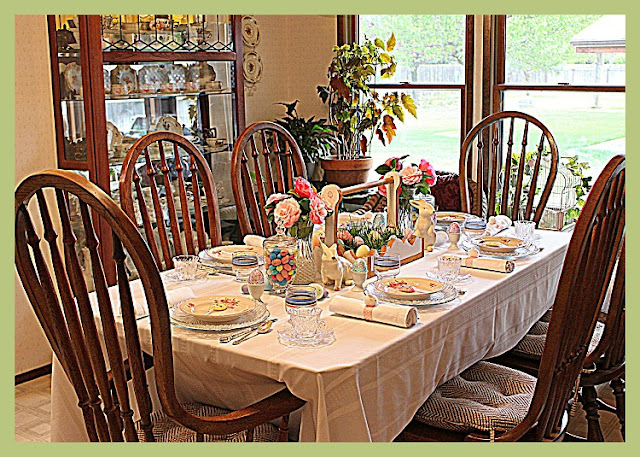 What a beautiful Easter table setting. Wishing you a Blessed Easter. Your centerpiece is so cute.A thrifty tablescape is always best, when you can turn it into fabulous like you have. The fresh cut grass is great. You are a girl after my own heart for finding great deals at thrift stores and sale items. I love the glittered eggs also. Have a fantastic day with your granddaugters.